Waco History Project: Did You Know? Facts from Waco: A Sesquicentennial History, by Patricia Ward Wallace, Virginia Beach: The Donning Co., 1999. Waco 's Suspension Bridge originally was a toll bridge? Completed in 1870 by the company that later would build the Brooklyn Bridge , it replaced a ferry boat across the Brazos. 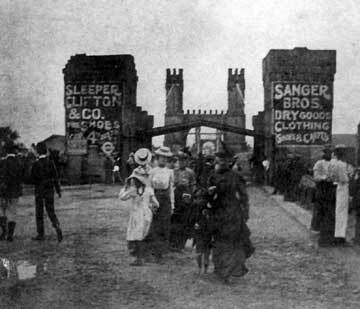 The Suspension Bridge featured billboards advertising local businesses? Waco was one of Texas ' major cotton centers? In the 1800s and into the mid-1900s, farmers by the thousands from throughout the region hauled wagons of cotton to town for marketing. Indian Spring Park was named after the natural waters that drew the Waco Indians to establish their village? The Wacos were drawn to to the shallow limestone crossing at the Brazos and the shelter of the chalk outcroppings that characterize the cliffs of Cameron Park. Fort Fisher was constructed to protect against Indian attack? It was built in 1867 under the orders of Secretary of War William S. Fisher after a Comanche raid on Fort Parker in Limestone County . However, fears about violence against settlers in this area proved false. Waco advertised itself as " Geyser City "? An abundance of naturally heated artesian wells served many purposes, including heated swimming pools, heating for buildings such as the ALICO tower and water for the Dr Pepper Bottling Co. (which started with company name Artesian Bottling Co. The 22-story ALICO tower, built in 1911, was the tallest skyscraper south of the Mason-Dixon Line for many years? ALICO was hit squarely by the 1953 tornado that destroyed much of downtown and killed 114 people but suffered only superficial damage? It then became the nerve center for efforts to rescue survivors. From the corner of Fifth Street and Mary Avenue a scar from the '53 tornado is plainly visible on the exterior of the second floor of the Dr Pepper Museum? Baylor University , founded in 1845, originally was in the town of Independence near Brenham? It moved to Waco in 1886. Texas Christian University had its campus in Waco ? After a fire in 1909 leveled Old Main on its Waco campus, TCU moved to its present site in Fort Worth . Waco was nicknamed the "Athens of Texas"? At the turn of the 20th century it hosted Baylor, TCU, Paul Quinn College and two business schools. Baylor didn't allow dancing on campus until 1996? Waco used to be the home of three airfields at once? They were Rich Field (where today's HOT Fairgrounds and Waco High are), Waco Army Air Field, where Texas State Technical College is, and Blackland Army Flying Field, where Waco Regional Airport is. Texas State Technical College was once a major air force base? Created in 1965 under the name Texas State Technical Institute, it was on what was James C. Connally Air Force Base. What is now the Waco Center for Youth on North 19th Street was once an army camp? Camp McArthur was a World War I training site for hundreds of infantrymen. On the steps of the McLennan County Courthouse in 1860, as candidate for governor, Gen. Sam Houston gave a fiery speech against Texas ' secession from the Union ? The speech drew jeers and angry retorts from many in the crowd. Houston 's supporters, afraid for his life, shoved him into the courthouse, where he left through a rear exit. Before he was a national figure, Clyde Barrow of the notorious Bonnie and Clyde gang was jailed for burglary and car theft in Waco ? Girlfriend Bonnie Parker, then 19, smuggled a gun to him into the Waco jail and he escaped. They were captured and sent to prison, but paroled because of prison overcrowding. Thus began their life of crime together. Waco was the birthplace of legendary black crooner Jules Bledsoe, who popularized the song, "Old Man River"? The legendary New York Yankees, featuring Babe Ruth and Lou Gehrig, played an exhibition against the Waco Cubs at Waco 's Katy Park? The date was April 4, 1929. The Yankees spent the night in the former Raleigh Hotel on Austin Avenue and walked the few blocks to the ballpark in pinstripes. Waco native Doris Miller, a kitchen worker, was credited with coming up on the deck of a burning ship and shooting down Japanese planes during the attack on Pearl Harbor ? Miller, who won the Navy Cross, survived the terrible attack that started World War II. Later Miller died when the aircraft carrier on which he was serving, the Liscombe Bay , was torpedoed. Elvis Presley played before a packed house in in the Heart O' Texas Coliseum? The date was Oct. 12, 1956. That evening he dined at the Elite Cafe. Presley frequented Waco in the 1950s when he was stationed at Fort Hood with the U.S. Army. When Baylor University opened the Ferrell Center in 1988 its first event was an appearance by former President Ronald Reagan? Into the mid-1980s Waco had four high schools? They were Waco High, Jefferson-Moore High (at what is now A.J. Moore Academy ), University High and Richfield High (on the campus that is now Waco High). School consolidation in 1986 for desegregation purposes reduced the number of high schools to two: Waco High and University. In the 1990s the Waco Independent School District created a third high school, A.J. Moore Academy , as a magnet high school. Today's G.W. Carver Academy , the Waco ISD middle school magnet, was a segregated all-black high school in the La Vega school district until school desegregation in the early 1970s? Waco ISD had an all-black segregated high school, A.J. Moore, as late as 1971? After court-ordered school desegregation, A.J. Moore, at Fourth and Webster, later was demolished. The old Waco High Tigers of the 1920s were one of the legendary football programs in Texas history? Coached by Paul Tyson, they won four state championships (1922, '25, '26, '27) and played in three state other finals. The 1927 team was awarded the mythical national championship. Today's Cameron Park Zoo is its second one? Long before McLennan County voters approved a bond issue to build the current zoo in 1988, William Cameron Park had a small zoo and a kiddie train that traversed the park grounds. For centuries, what we know as the glassy Brazos River often was a muddle trickle through town? The city built the low-water dam of the Brazos in 1971 to create a stable and steady water level, creating what became Lake Brazos . Submerged under Lake Waco is the remains of a small town? When the Army Corps of Engineers began construction of a dam on the Bosque River in 1929, many homes and some rural businesses had to be relocated or abandoned. At one time all travelers headed from Dallas to Austin and back had to navigate Waco 's traffic circle? That was the case (making such businesses as the Elite Cafe and the Health Camp staples for generations of travelers) until the construction of Interstate 35 in the 1960s. What became Valley Mills Drive once was a lonely stretch of state highway? It was the origin of Highway 6 — known as the Valley Mills Highway for taking travelers to the town of Valley Mills (the highway was rerouted in 1965 when Lake Waco expanded to its current size). In the 1950s, the sparse traffic on the highway made it a popular spot for motorcycle races and drag racers on the edge of the city.